Contact/interfacial mechanics, tribology of advanced materials and novel lubricants, design and engineering of energy-efficient surfaces, including 1) novel approaches of extreme-condition tribological and energy efficiency problems; 2) theories of and methods for contact and interfacial mechanics, numerical simulations of frictional heat transfer and mixed-thermo-elasto-hydrodynamic lubrication problems; 3) thermal-tribological designs of machine elements and their surfaces, multidisciplinary modeling of asperity contact; 4) virtual surface texturing and novel surface texturing technologies; 5) new lubricants and lubrication technologies; and 6) industrial applications of models, surface designs, and novel lubricants for friction reduction, lubrication enhancement, and failure prevention. Professor Wang believes that encouraging active learning and promoting motivational forces, or psychological stimulators, can help achieve the best teaching effect. She feels that teaching is an art that requires a constant effort for improvement. She consistently conducts teaching experiments and search for effective means of classroom instruction. Professor Wang teaches Design of Element at the undergraduate level and Tribology courses at both undergraduate and graduate levels. 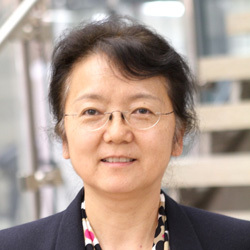 Professor Wang is very active in supervising graduate and undergraduate research projects.